Libya is still firmly in the headlines as tensions rise around the country's capital, Tripoli, in what could be a major shift for North African politics. Europe is keeping a close eye on events across the sea with migration a contentious issue running up to the European elections. But amid talk of political turbulence, civilians and migrants are getting caught in the crosshairs. 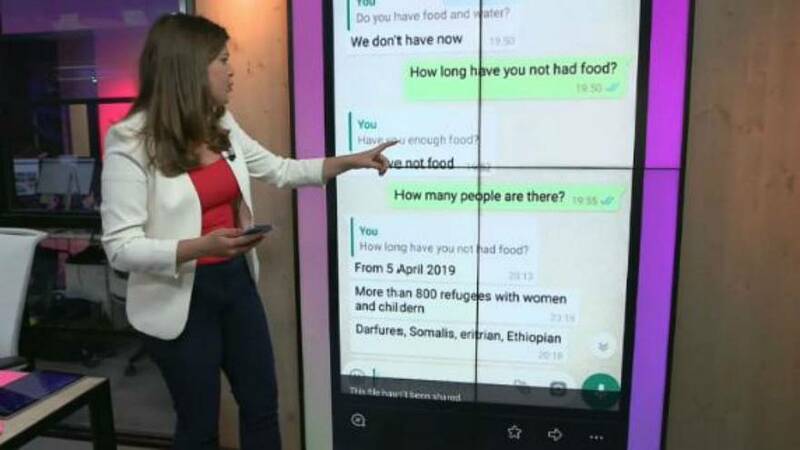 The Cube spoke to a migrant in a detention centre on the outskirts of Libya via WhatsApp to hear his story as Haftar's assault on Tripoli intensifies. The identity of this person will not be revealed for his safety. "This sound can explain our situation right now," the man said in a WhatsApp voice note. "It is not far, maybe 1,000 metres from our centre." The sounds of bombs and military arsenal echo in the air surrounding the detention centre in Qasr bin Ghashir, a southern suburb of Tripoli. When asked how he felt being inside the camp, the man called his situation "indescribable." The Cube has been speaking with him since April 8, and tensions have escalated since. By that time, this man had not eaten in three days and showed images of the lack of water in the camp. On April 10, he said that "if you manage to get a few rice, you are lucky. The majority of people here are hungry now to the indescribable." The sound of violence close to the detention center. He is not alone, however. Hundreds are living at this detention centre including women and children. Videos of those within these centres show people with their arms crossed. "[It] explains that we are not free. We are detained," he said. "The people have been suffering more than anything. There is not any food. You can see the face of the people. Three days, no food. Nothing in Qasr bin Ghashir detention centre," he said on April 8 and has since said that aid has not yet arrived. Medicine San Frontiers (MSF) have expressed their concern for those living in detention centres. Although the latest assault has been dominating the headlines, this is all but a regular occurrence for occupants of this detention centre, who live in fear of getting caught up in the violence. "This is the third time in the past 7 months that Tripoli has seen conflict, yet many trapped in detention are there because of EU policies that enable the Libyan Coast Guard to return people to Libya in violation of international law. Libya is clearly not a place of safety," MSF Sea said in a statement on Twitter. The man in Qasr bin Ghashir reaffirmed this, saying in 2018 that the militia used the camp as a base and "forced us to do hard work". How did he get to the camp? His story is like so many others, starting at the decision to try and make it to Europe. He entered Libya through the desert and stayed with a human smuggler for more than six months, he told The Cube. The smuggler asked for more money for them to cross the sea into Europe. However, in October 2017, the conflict was sparked between the government and smugglers, leaving those attempting to cross the sea to be transported to migrant detention centres. As Libya enters a deeper crisis, Europe has yet to present a united front. Although EU foreign policy chief Mogherini said the bloc was united in condemning Libyan military commander Khalifa Haftar's assault on Tripoli, France has yet to do the same, instead of calling blame on all sides. A European-wide foreign policy on immigration since the 2011 crisis has failed to materialise, with countries such as Italy and Malta cracking down in recent years. As policymakers debate, some of those living in detention centres without basic human rights are calling for help.